A true companion of every cat lover, the Your Cat magazine is the leading and highest selling magazine to feature everything related to cats and cat keeping. If you love your cat, Your Cat is a must read magazine to have a happy, healthy and well behaved cat. Your Cat magazine publishes 12 issues in a year and every issue has unique and thoughtfully chosen topics to make you understand your cats better. 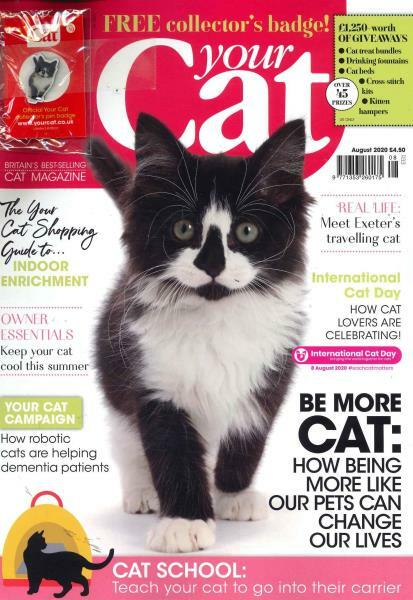 The content of the magazine is very friendly and informative to appeal to a large chunk of cat lovers. The picture of lovely cats that feature on the cover as well as inside the pages of the magazine will make you love cats even better like never before. Included under the cat care section of the magazine are the insightful articles by expert panel of seven professionals to educate and inform you on various issues regarding to cat health, grooming, training, caring, nutrition and behavior. Another informative section on helpful advices would provide you plenty of tips and suggestions for cat parenting and choosing the right and healthy kitten. Also included are the helpful advices on breeding, vaccination and veterinary issues. If you too want to keep your cat in best of health and behavior, you can simply subscribe the Your Cat magazine to get a regular feed on easy cat caring tips and editorials. During the subscription period, every issue of the magazine would directly be posted to your home.